When you are angry and upset you can’t concentrate on tasks. Your mind wanders to the upsetting event and you keep rehashing it – having lots of “do-overs” to try and feel stronger, and less vulnerable. That’s normal. But it’s stressful to have to live through the constant rehearsals in your head until it passes and you feel grounded again. Stress, brought on by unprocessed emotions like anger impairs your cognitive functioning and social skills. Stress hormones cause rigidity in the communication between neurons in the brain, affecting your performance, Nature Communications, 2014. FOCUSING PROBLEMS – Stress interferes with your ability to focus on the job at hand, whether it’s driving a car, listening and following instructions, or answering customer questions. LEARNING: Stress changes the way you learn. It interferes with conscious purposeful learning, Neuroscience, 2012. Chronic exposure to stress leads to a loss of neurons in the brain’s memory center, the hippocampus, Neuroscience, 2012. 1. Recognize the unique triggers that propel your stress into overdrive. 2. Take preventive action so that your ability to learn and process information remains in tact. JUDGEMENT – When the emotional part of your brain (amygdala) is activated and operating in full force, such as in anger and stress, there is a disruption in the connection with your logical and reasoning brain (pre-frontal cortex). ERRORS – A combination of poor focusing and bad judgment leads to a high error rate. You feel annoyed and frustrated with yourself. Annoyance and self-criticism elevates stress and the cycle goes into another repetitive cycle. Research shows that those who blame themselves and are self-critical, have higher blood pressure when doing important tasks and maintain that level even when they switch to leisure activities (Health Psychology, 1992). High BP indicates abnormal stress, with all the consequences pointed out in Anger, Stress and Health. 2. Understand and control your fear of not being perfect. 3. Talk to yourself in ways that are not self-critical and self-blaming. PRODUCTIVITY – Feeling bad about your performance not only demotivates you, but makes you feel less in control. Stress in the workplace is often associated with feeling out of the loop and not having a say in how things are decided. Am J Health Promotion 24(3), 2010. 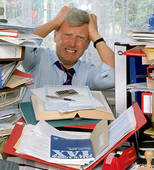 Errors in judgment and poor focus contribute to the workplace stress that lowers productivity. QUALITY OF WORK – bad judgments, increased errors and unfocused attention affect the quality of your work. That can mean losing business, being a negligent parent, or injuring someone in a vehicle. It’s very serious. 3. Identify the voice that demands optimal performance at all times, leaving you drained. PSYCHOTHERAPY CAN HELP YOU PERFORM AT WORK AND IN YOUR PERSONAL LIFE IN A PRODUCTIVE AND EFFECTIVE MANNER.